1 of 3 Heat gas grill to medium-high or prepare charcoal grill with medium-hot coals. Stir together mayonnaise and 1 tablespoon of the dill; set aside. 2 of 3 In the bowl of a food processor, pulse remaining tablespoon dill, the salmon, bread crumbs, scallions, salt and pepper until combined. Form into four 3-inch round burgers and coat both sides with nonstick cooking spray. 3 of 3 Grill burgers for 5 minutes per side or until cooked through. 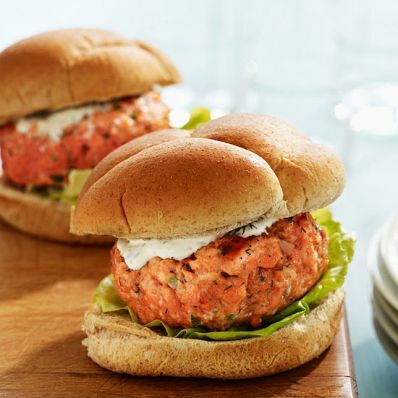 Place burgers on buns and spread each with 1 tablespoon dill mayonnaise.